The staggering Staggies pop over the bridge to play the Caley Jags in this game postponed from a couple of weeks ago after heavy rain had left the pitch somewhat waterlogged. It's the 6th and final Highland derby coming up on Friday night with BBC Scotland getting in on the action from the Caledonian Stadium with Ross County the visitors for a 7:05pm kick off. Every one of these games has been passionate, enthralling, dramatic and left the fans wanting more. Well, it's here, the next installment. Other games being played on the same night are Ayr -V- Morton and Queen of the South -V- Falkirk, so interest at both ends of the table. 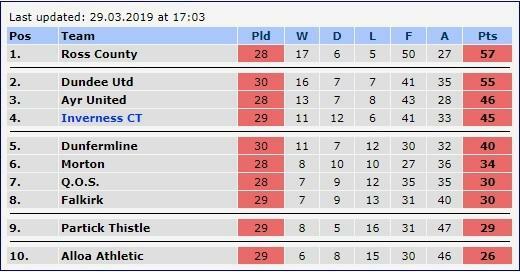 After last weekend, we are in fourth place but five points ahead of contenders Dunfermline Athletic. Dundee United also suffered a surprise home defeat at the hands of Queen of the South. County remained top, but the gap has narrowed. Our last game was a laboured no score draw against lowly Falkirk on Saturday. A poor first half livened up after the interval but we never got the break of the ball and had Mark Ridgers to thank for making a point blank save in time added on to ensure we got a point. It was an opportunity sidestepped to put more pressure on the teams above who faltered apart from Ayr United. The games between the clubs this season have been a fantastic advert for Championship football in the Highlands. They have had everything. The first two were drawn before County won the New Year derby 2-1 in Dingwall. There followed two tremendous 2-2 draws in Scottish Cup action including extra time with Inverness winning a dramatic penalty shoot out 5-4. Mark Ridgers making one save and Nathan Austin converting the winning kick to send Inverness into the next round. Thanks to that we can now look forward to playing Hearts at Hampden on April 13th in the semi-final. 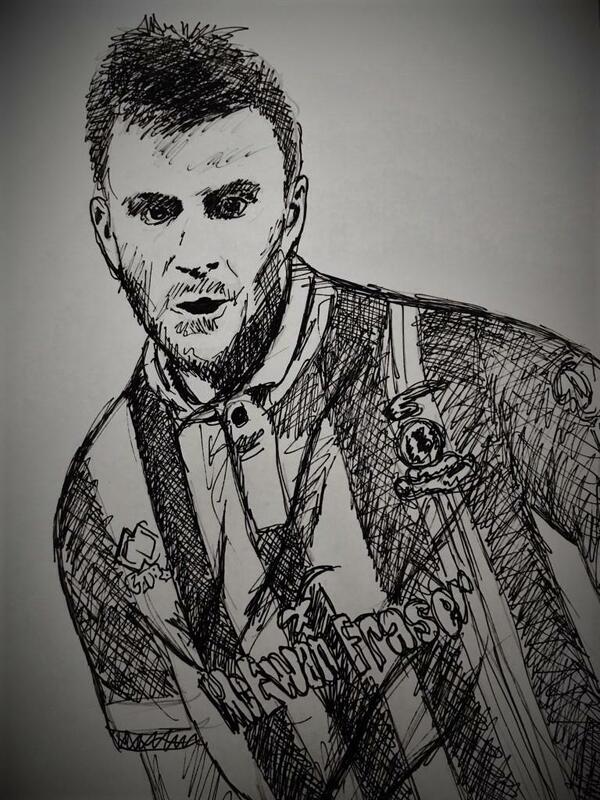 Aaron Doran has been in sparkling form recently with four goals in the last five games, and but for some last ditch Falkirk defending he would have made it five from five. The wee Irishman loves a goal against County as well although he only has one this season so far in the 2-2 cup draw at Dingwall. Aaron has come back from a few injury setbacks and has never been in better form, scoring 11 times this season. 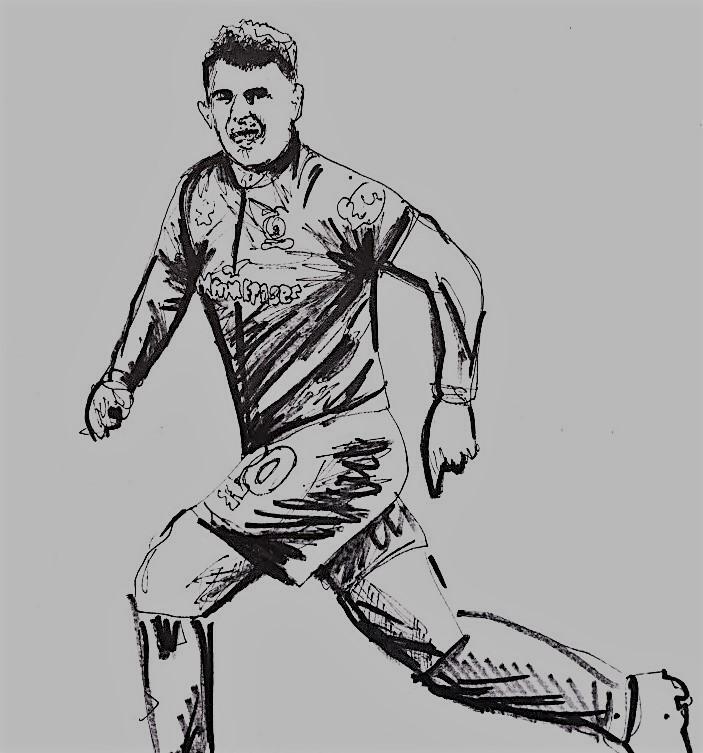 Here's a familiar image of Doran wheeling away after scoring yet another goal and captured in this sketch by our own ICT fan and wonderful artist Sophie Robb. You can see these and many more fantastic images on her twitter account or on her ETSY account. Sean Welsh is out after it has been confirmed that he has broken a metatarsal again. Robertson speaking about Welsh said: “Sean has been terrific for us this season – one of the unsung heroes. “He’s in the team every week and he’s in the team every week for a reason, with the job he does for us. He has been brilliant, he’s been consistent and he does what it says on the tin in the middle of the park. He wins the ball, passes it, breaks play up and he also gets forward. He has also become a very reliable penalty-taker to boot, but I think it is his influence on the team. He is one of our experienced players, patrolling the middle of the park and mixing play up. Here's the youngsters against Ayr United in the 5-2 win. Matheus Machado scored a couple of the goals in a 5-2 u18 win over Ayr United He had been drafted into the first team squad recently and it's good to know he has goals in him. Check out his second goal. How about that for a chip. Iain Stewart, eat your heart out! Ross Gunn and Cameron Harper also scored against Ayr as did Daniel Mackay, and he was on the bench against Falkirk as well. Anthony McDonald is a doubt but could make the squad. Another man who seems to relish these games is Liam Polworth who will be an integral part of Robertson's plans. Liam played his 200th game for Inverness on Saturday against Falkirk. Liam has only three goals to his name this season and is due another. Polly is also on Sophie's sketch list, and as they say on Blue Peter, here's one she prepared earlier. County's depth of squad will not present them with any major issues as they stagger towards the Championship tape. 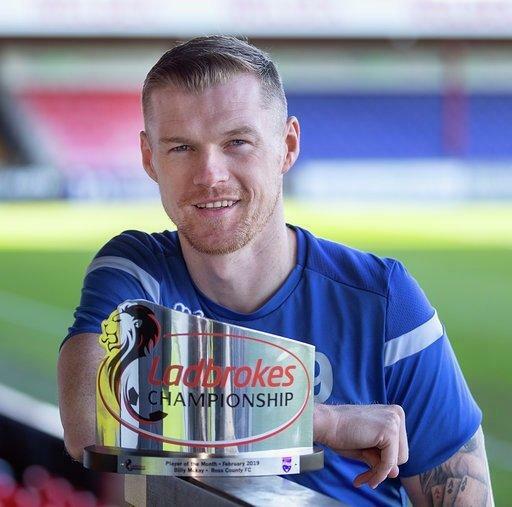 Billy Mckay is out for the rest of the season after breaking his arm whilst scoring a hat-trick against Ayr United recently. Mckay had scored 20 goals this season for County and was in fine form. He proved he is still a winner though, even when out injured and he has won the Championship player of the month whilst wristing up with his stookie. Good luck with the recovery Billy. County's management duo will be without defenders Callum Morris and Liam Fontaine who will not feature until next season and Iain Vigurs will likely miss the rest of the season as his foot injury continues to give him problems despite a forty-five minute outing against Kilmarnock reserves. Keith Watson took a knock at Alloa and is out and Michael Gardyne is struggling, but that could be a smoke screen and I expect he will turn up, even if it's just to try and wind up the Caley Jags players. Sean Kelly and Ross Draper made the bench for the trip to Alloa Athletic and should be included again. County's English defender Callum Semple’s Scotiish FA hearing for betting on football matches has been pushed back a fortnight to Thursday, April 11th. Semple was earlier this month given a notice of complaint accused of making bets between the period of July 1 and March 1, in which he also played for Queen of the South on loan from Sheffield United. Don't forget to buy your tickets for the SemiFinal against Hearts at Hampden. This may appear to be an alien concept for some, but always remember this, in space, no one can hear you scream. If you are sitting in your living room passing round the werther's originals and watching on TV, the lads won't be able to hear you. They have been brilliant to get this far in the cup and it's a great day out at the National Stadium. Be there or be square! 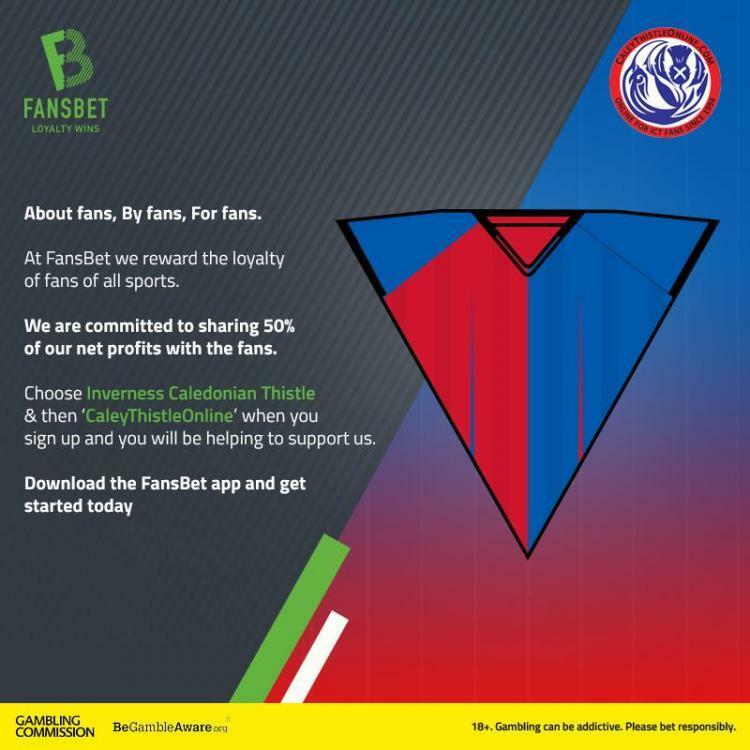 If you like a wee flutter, our partnership with FansBet can offer you something. 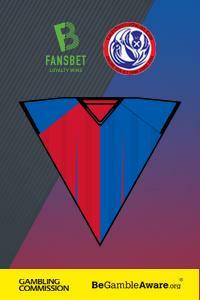 Just click on FansBet to get started. "Remember to select CaleyThistleOnline when you register and you’ll be helping us support ICT fan causes."